The Amana Corporation has been in the refrigeration business since 1934. It was among the first to offer a side-by-side refrigerator for home use in 1949. It is still a respected brand today and continues to produce high-quality refrigerators that are popular for homes and businesses alike. If you are considering a new refrigerator for your home, an Amana side-by-side refrigerator may be a good choice for you. 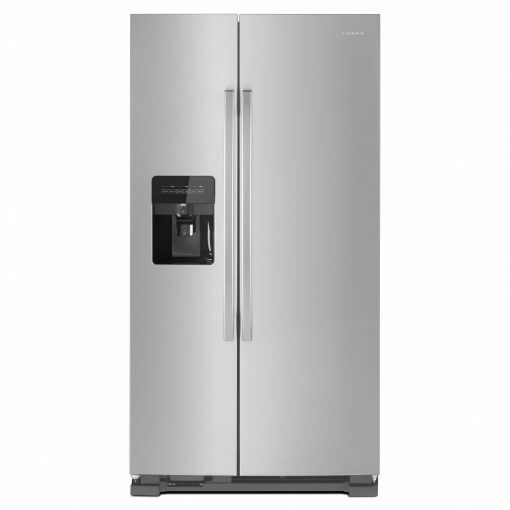 We have gathered specs and reviews on the Amana side-by-side model number ASI2175GRS and compare it to other side-by-side refrigerators. This information can help you determine which fridge will best meet your needs. 1. 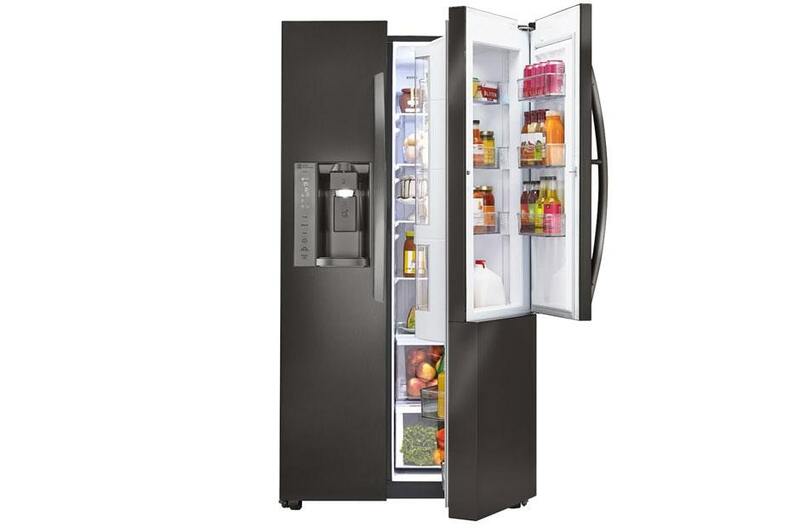 What Is an Amana Side-By-Side Refrigerator? This is an appliance that keeps your fresh food cold and your frozen food at a safe temperature to prevent it from thawing. It has two compartments: the freezer on the left and the refrigerator on the right. Each compartment runs the entire vertical length of the fridge, which is why it's called "side-by-side." A refrigerator has a coolant which is circulated throughout coils inside your fridge by a compressor. As the coolant travels through the chiller cabinet it removes heat from the air inside the fridge. It then passes through the compressor which changes it to a hot, high-pressure gas. This gas flows through condenser coils in the back of the fridge, dissipating the heat into the air. It then then travels through an expansion valve where a drop in pressure turns it back into a cool liquid, and the process starts all over again. 3. 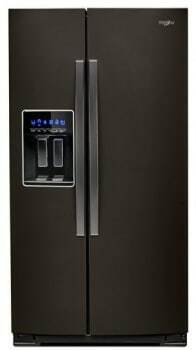 Where Can I Buy an Amana Side-By-Side Refrigerator? These refrigerators are available at home improvement stores and appliance stores. You can also order them online, but shipping costs will be prohibitive in most cases. Ordering online and arranging for in-store pickup is a cheaper option. When we review a product, we take our time to comb through industry reports and professional evaluations. We look for manufacturing issues such as recalls and repair trends. We also read consumer comments and complaints. We want to know if customers are having issues with a certain feature or if there are reliability concerns. Then we compare this refrigerator with other brands to determine if it is a quality product. For the 36-inch version, total capacity is 24.6 cubic feet, with 15.46 cubic feet for the fridge and 9.11 cubic feet for the freezer. For the 33-inch version, total capacity is 21.4 cubic feet, with 14.64 cubic feet for the fridge and 6.77 cubic feet for the freezer. Three adjustable gallon door bins, one fixed full-width door bin and one dairy compartment. Fridge has one full-width climate-controlled drawer and one full-width non-climate-controlled drawer. Freezer has three fixed full-width door bins, three fixed full-width wire shelves and one plastic drawer. Door-mounted ice and water dispenser supplies cubed or crushed ice. Electronic temperature controls are mounted inside the unit. Limited one-year warranty for parts and labor. MSRP is $1,149-$1,249 depending upon color. Purchase at any home improvement or appliance store. The biggest pro for this fridge is the affordable price. It is one of the better bargains on the market. The quality is good as well. It has a favorable reliability rating and performs very well. The biggest con is that it is a very basic fridge. It lacks some of the fancier amenities such as slide-out spill-proof shelves or a deli drawer. However, for anyone on a budget who doesn't need all the bells and whistles, the Amana side-by-side is a solid if uninspiring choice. Total capacity of 28 cubic feet, with 17.56 cubic feet for the fridge and 10.93 cubic feet for the freezer. Dimensions of 36 inches wide, 35 inches deep and 69 inches tall. Two adjustable gallon door bins and three fixed full-width bins. Fridge has four adjustable shelves, one full-width humidity-controlled drawer, one full-width non-climate-controlled drawer and a utility compartment. Freezer has three fixed full-width door bins, four fixed shelves and two plastic drawers. Door-mounted ice and water dispenser supplies filtered water and cubed or crushed ice. Limited one-year warranty on parts and labor and a five-year limited warranty on the cavity liner and sealed system. Available in black, white, stainless steel and black stainless steel. MSRP is $1,699-$1,899 depending upon color. This Whirlpool model is an upgrade from the Amana. Its biggest pros are the extra space and the flexible shelving arrangements. The water and ice dispenser is also convenient and easy to use. The main con is that consumers report this refrigerator has a slightly higher-than-average repair history. Total capacity of 26 cubic feet with 16.5 cubic feet for the fridge and 9 cubic feet for the freezer. Dimensions of 36 inches wide, 32 inches deep and 69 inches tall. Two adjustable gallon door bins, a dairy compartment and two full-width fixed door shelves. Fridge has two shelves, a deli drawer and two full-width crisper drawers. Freezer has four fixed door bins, one flip shelf, two wire shelves and one plastic drawer. Door-mounted ice and water dispenser provides filtered water and crushed or cubed ice. One-year limited warranty on parts and labor. Available in white, black, stainless steel and black stainless steel. Retails for $900-$1,079 depending upon color. The biggest pro to this model is the price. This is a great price point for a fridge that offers a lot of space and some nice shelving arrangements. The cons include complaints that the ice maker is noisy, and the deli and crisper drawers can squeak and rub. The warranty is also quite poor with only a year of coverage. Total capacity of 26.1 cubic feet, with 16.9 cubic feet for the fridge and 9.2 cubic feet for the freezer. Dimensions of 36 inches wide, 34 inches deep and 70 inches tall. Nine door shelves including the Door-in-Door, a special feature that allows for quick access to favorite items. Fridge has four shelves, a dairy compartment and two full-width crisper drawers. Freezer has three door bins, three shelves and two plastic drawers. The warranty is one year parts and labor, five years on the sealed system and compressor, and 10 years on the linear compressor. Available in stainless steel or black stainless steel. The MSRP is $1800-$1900 depending upon the color. This LG model looks sleek and modern in the kitchen. Pros include the Door-in-Door feature that provides an easy way to grab snacks and drinks without rummaging through the whole fridge. Other nice bonuses include a door alarm and smooth-touch temperature controls. LG refrigerators have the best reliability and customer satisfaction ratings as well. If all that weren't enough, the warranty is the best in the business. There really are no cons, other than the price may be high for homeowners on a budget. However, for all this refrigerator offers it's a pretty good deal. Total capacity of 24.52 cubic feet, with 15.72 cubic feet for the fridge and 8.8 cubic feet for the freezer. One gallon door bin, two full-width bins and a dairy compartment. Fridge has four shelves, one humidity-controlled crisper bin and one non-humidity-controlled bin. Freezer has three door bins, four shelves and one drawer. The warranty is one year parts and labor, five years on the sealed system, 10 years parts and five years labor on the digital invertor compressor. Available in white, stainless steel or black stainless steel. MSRP is $1,052-$1,157 depending upon the color. This is a popular refrigerator. Consumers love it for its dependability. The pros include the price, reliability and efficient cooling. The warranty is also outstanding. The main cons are that the shelves and bins are pretty basic, and it lacks a few of the nicer features such as a deli drawer. Which Side-By-Side Refrigerator Is Best? This is a tough call as consumers have their own favorite features and perks. However, the clear standout if price is not an issue is the LG side-by-side. It offers great features, an outstanding warranty, and solid ratings and reviews from professionals and consumers alike. The Whirlpool model mentioned above simply can't compete with the LG's reliability and repair record even though it's at a similar price point. If you are more budget-minded, the Samsung is your best choice. It has the best warranty of the cheaper models, the nicest design, and the best reliability and repair record. The Frigidaire is cheaper but does not have good customer reviews or ratings. The Amana, while it is a solid product, is just not that exciting compared to the Samsung. It also has a terrible warranty that makes you wonder if the company believes in its own product. Of course, space is a concern when purchasing a new fridge. If there's not room enough for your food it doesn't matter how fancy the controls on the door are. The roomiest fridge above is the Whirlpool with an amazingly generous 28 cubic feet of space. Buy this one if you're feeding the soccer team every night. The Frigidaire and the LG are next with about 26 cubic feet. Bringing up the small end are the Samsung and the Amana, both in the 24-cubic-feet range. The Amana side-by-side refrigerator, while a decent appliance that performs well and looks OK, is out-classed by its competitors. For less money you can get more space and about the same features with the Frigidaire. For less money you can get the Samsung which has better features, looks nicer and has a much better warranty. For a splurge you can get the LG or Whirlpool. There's just not much reason to buy the Amana.